Happy Friday everybody! I hope all of my east coast readers are now past any danger of Earl by the time you read this! Last week's Friday Firsts featured a really exciting first from Debbi Does Dinner Healthy! She was interviewed by her local news on money-saving meal tips. You should head over and read about her experience and watch the video - it's great! Congrats Debbi and thanks for sharing your first! My first for this week was trying two new cereals from the Foodbuzz Taste Maker program. 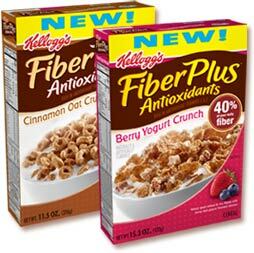 Kellogg's Fiber Plus Antioxidants in Berry Yogurt Crunch and Cinnamon Oat Crunch. Both Johnny and I tried the Cinnamon Oat Crunch, which reminded me of a healthier tasting Honey-Nut Cheerio. I ate these plain by the handful, or over yogurt. Johnny ate it with milk and noted that it got soggy faster than usual, which then gave it a bit of a "cardboardy" flavor. I was the only one able to try the Berry Yogurt Crunch because it contained whey, but I loved it! In fact, the box is just about gone! The flakes are really big and have little flecks of red (berry?) on them. There are granola crunchies and also little nuggets of yogurt covered granola. It's a really crunchy, hearty cereal. I ate it with milk and also a few nights as a snack over yogurt. The boxes of cereal were generously provided compliments of Kellogg's and the Foodbuzz Tastemaker Program. The review is my honest opinion of the product. I think I've tried a sample of those cereals and wasn't too impressed. I'm not a big cereal eater though. I do like it over yorgurt though! Thanks! I actually shaved 10 minutes off my 30 minute bolognese sauce, and suprisingly, its just as good! Hope you and Johnny have a great long weekend! Great to know about this cereal- I haven't tried it yet!